Ontario is ready to go ahead with pension reform on its own after Ottawa blocked a consensus on Canada Pension Plan reform. 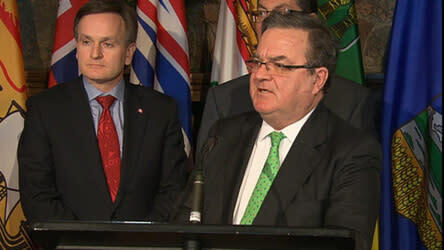 At a news conference following a meeting with his provincial counterparts in Meech Lake, Que., federal Finance Minister Jim Flaherty said now is not the time to move on the pension issue​. Flaherty said there was a "frank discussion" about CPP changes, but he believes the economy is too fragile. "We believe that CPP payroll taxes can hurt the economy and distract from what truly matters for all Canadians — keeping our economy strong and our finances in a strong fiscal footing is the plan of this government," Flaherty said. "Now is the time for fiscal discipline. And that is why all governments must focus on encouraging job growth and getting their fiscal houses in order. Now is not a time for CPP payroll tax increases," Flaherty said. ​While several provincial finance ministers have been pushing for an enhancement to the CPP, so there will be a richer benefit available to the generation retiring 30 years down the road, Flaherty has been reluctant to implement reforms. He said he could not predict when the economy might be strong enough to support a premium increase and said Ottawa does not plan more discussion on the pensions issue. P.E.I. Finance Minister Wes Sheridan put a proposal on the table that would increase CPP contribution rates, by both employers and employees. Ontario and Prince Edward Island have been leading the charge to boost CPP contributions. He said his plan has been "misconstrued" as doubling pension premiums. In fact, only people earning in the $100,000 range would see their premiums doubled. The CPP enhancement is necessary because people earning between $35,000 and $100,000 are not saving for their own retirements, Sheridan said. The younger generation is facing low incomes, high debt and no private pension plan and will not have enough to live on unless CPP is improved. Current benefits pay just over $12,000 a year and even with Old Age Security and the Guaranteed Income Supplement, the income is just $16,000. All the finance ministers agree there is a shortfall, Sheridan said. "When we first met in 2010, we realized that Canadians were not saving, and it’s the middle class that we have to point out as being the most guilty," he said. Flaherty said any solution to the problem would have to target just the 23 per cent of Canadians who are thought to be in the $35,000 to $100,000 bracket and don't have savings. Nova Scotia, Newfoundland and Labrador, Manitoba and Quebec also appeared to favour some kind of CPP enhancement measure. Sousa said Ontario believes a change is urgently needed now, while most of the baby boom generation is still paying into CPP and there is time for that investment to grow. "Over 50 per cent of Ontarians do not have a pension plan. They're going to be fully reliant on CPP and OAS to provide for them and at $12,000 a year, that is insufficient," he told CBC News ahead of the meeting. In fact, just 34 per cent of all Canadians have a private workplace pension and one-third of Canadians have no savings at all. "Ontario's always stated our priority is to enhance CPP. It's a well-run system, it's well-managed, it's least expensive and it's the most appropriate means by which to proceed," Sousa said on CBC's Power and Politics. He gave no details of what Ontario plans, but made it clear that CPP reform was part of a wide-ranging initiative around pensions. A visibly angry Sousa said he learned at today's meeting that Ontario would be "shortchanged" on its transfer payments from the federal government, getting $640 million less than expected. "We're the only government to have actually cut spending year-over-year last year. So we're getting penalized … for doing good work, and we want to make certain that we have fairness to Ontario as well," Sousa said. Flaherty has said he prefers pooled registered pension plans (PRPP), in which employees contribute to a pooled fund that is invested for long-term returns. He has said PRPPs would be a solution to encourage savings, as they would have lower fees than RRSPs. ​However, they would not be mandatory, nor would there be any mechanism to prevent employees who get into financial difficulty from removing their savings from a PRPP. Saskatchewan and Quebec are among the provinces that have passed laws putting PRPPs in place. Sheridan sees the PRPP proposal as a good one, but says CPP reform is a better option. He suggests using several vehicles to improve pensions. "I don't call it a tax on employers. It's an employee benefit. That's a very big difference," he said. Bernard Dussault, former chief actuary of the CPP, also dismissed the idea that a CPP enhancement would kill jobs. "The CPP, when it was implemented in 1966, it was subject to an immediate increase of 3.6 per cent deducted from payroll and salary. That did not affect the economy," he said. "From 1987 to 2003, the contribution rate was gradually increased from 3.6 per cent to 9.9 per cent and there has been no slowdown in the economy. To the contrary, the employment rate increased during those years." Susan Eng, vice-president of advocacy for the Canadian Association of Retired Persons, said the 300,000 members of CARP see pension reform as an urgent issue and want the finance ministers to continue working toward a consensus. "They have to agree to increase the CPP, it’s that simple. It isn’t the only option to help people save for their retirement, but is the one that’s on the table and a very good one," she said.